For the last few years we have been developing a design and manufacturing system that would free us from the traditional methods of production. This marks a return to a kind of primitivism; before tools and machines could inform the way we design and think about design. This system allows us to use our bodies as tools to shape and create spaces and objects, whereas working just with our hands does not produce the same results. Our hands are too well trained; they respond to our brains in a comfortable way. We began to re-cycle packing materials (bubble wrap, packing peanuts, etc.) because they are readily available, easy to work with, and highly malleable. They can be cut, glued, joined, folded, and twisted without any of the preciousness or skill required when dealing with more traditional building materials. Since there is neither an associated aesthetic nor a prescribed way to work with them, their manipulation required us to develop organic construction techniques that would give our objects structural integrity with a minimal use of material. Since then, we have created many public installations and spaces utilizing this system and various techniques. Of course, the system has evolved. It was impossible not to develop a level of skill that would allow us to achieve more complex objects. We experiment with different finishes, for instance, using gaffer’s tape and designing stickers for each project. Applied over surfaces these work as a plastic skin that keeps all the parts together, and as a graphic layer unifying the forms into a Total Object. To design a public installation in the middle of a city is very different from designing one in a gallery context. In the city, the functionality of the object is justified by its context; people continuously confront it. In a gallery, functionality is deprived of real context. There is no need for a functional object in an art gallery, people do not go to a gallery to have a coffee or read the newspaper. For Rice Gallery, however, we wanted to make sure that visitors would come in and spend time in the installation, exploring and using it rather than just consuming it as an image behind the glass wall. Garden Object is an abstract structure that is a crossover between the traditional English garden and Hieronymus Bosch’s famous painted triptych, Garden of Earthly Delights (1500-1505). This painting, which hangs in the Museo del Prado in Madrid, has been forged into our subconscious minds since childhood, as much for its eerie atmosphere as its detailed scenes, which we could look at for hours. For Garden Object we appropriated the paintings pallet of colors, reinterpreting the pinks and the blues into graphic patterns. To create a kind of triptych, we made an installation with three different kinds of spaces: one light and airy, one dark with projections of ever-flying birds, and one in which a phosphorescent water feature lends a feeling of the surreal. El Ultimo Grito is the London-based design studio founded in 1997 by Rosario Hurtado and Roberto Feo. In 2010, they founded Shopwork and POI, an independent publishing, research, education and design platform. The studio’s work is in the permanent collections of the Museum of Modern Art, New York, the Stedelijk, Museum, Amsterdam, and the Victoria and Albert Museum, London. 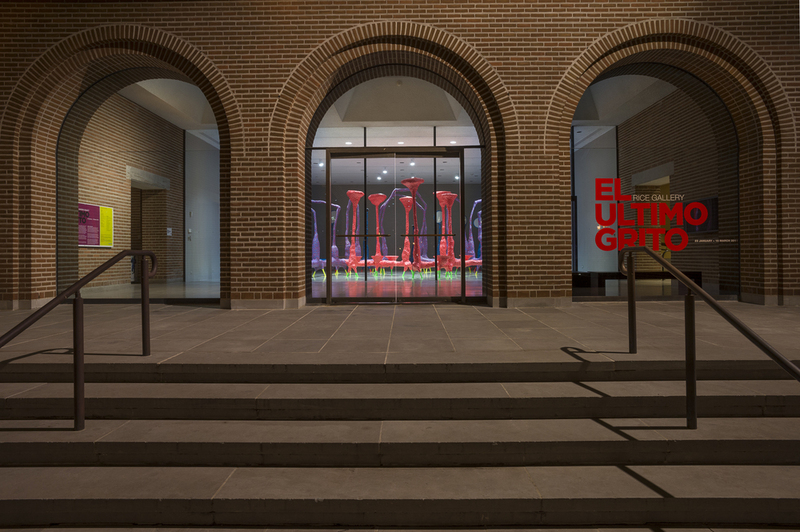 In 2012, El Ultimo Grito was awarded the London Design Medal. Rosario Hurtado was born in Madrid in 1966. She studied Economics at Alcala de Henares, Madrid before moving to London in 1989, where she studied Cabinetmaking at London College of Furniture and completed a BA in Industrial Design at Kingston University, Surrey. A principal lecturer in the Design Department of Goldsmiths University, London since 1999, Hurtado has taught at the Royal College of Art, London, and the University of Fine Arts in Hamburg, Germany. She is co-director, with Roberto Feo, of the Space and Communications Program at Geneva University of Art and Design (HEAD), Switzerland. Roberto Feo was born in London in 1964 and grew up in Madrid, Spain. He studied Sociology and Social Anthropology at Complutense University, Madrid before moving to London in 1990. 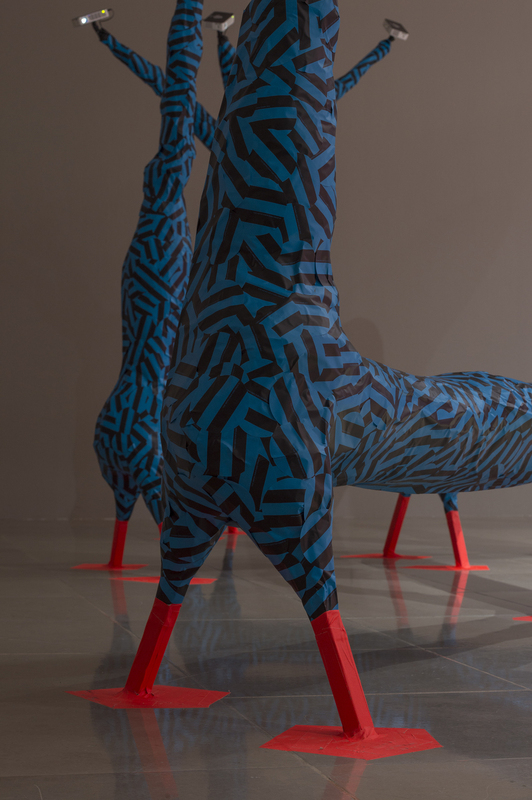 Feo studied Furniture Design at London College of Furniture and received a MA in Furniture Design at the Royal College of Art, where since 1999 he has been a principal lecturer at the Design Products Department. Feo is currently a Senior Design Research Fellow at Kingston University, London and with Rosario Hurtado is co-director of the Space and Communications Program at Geneva University of Art and Design, Switzerland.